Title : Pumpkins, Pumpkins, Everywhere! the purfect book to read on halloween morning. it doesn't have much of a story line though. just a nice rhyme. good for a 2-3 year old. Pumpkins, Pumpkins Everywhere is a book that is easy to listen to with engaging illustrations. The author uses jack-o-lanterns to show facial recognition, direction, animal recognition and the fun parts of Halloween. 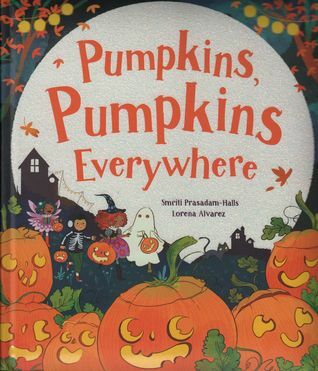 Pumpkins, Pumpkins Everywhere would be an excellent book to use with special learners or ESL kids because of phrases that repeat like "Pumpkin wet and pumpkin dry... Pumpkin happy and pumpkin sad." This book works for classroom or home. This is a Halloween "Friendly" book suitable for small children. A fun and friendly hallowe'en story, perfect for children who enjoy the festive side of hallowe'en without the fright aspects. Clear, repetitive text makes this book good for learning readers as well. The characters are racially diverse in a way I appreciate and the illustrations are full of details that encourage interactivity. The words just roll right off your tongue when you read this book aloud. The illustrations are vibrant and busy, which leave lots of opportunities to make reading this book with your child interactive. It will make you want to carve a pumpkin together after reading!